To many, the Western grasslands still reflect the essence of this country: the vast plains that begin with prairie and bump up against the Rockies, home to herds of cattle and the cowboys that run them. Yet this indelible image belies the facts, as much of the nation's rangeland has been degraded by overgrazing. Land where lush, waving grasses flourished is now eroded and only sparsely covered with plants. One consequence, says farmer and rural public policy expert Michael Bowman of Wray, Colorado, is that "hundreds of small communities whose economies relied on healthy grassland are withering with the grass." Many ranchers, conservationists, and investors are determined to revive this magical and (once) highly productive landscape. And have embarked on doing so by increasing the density of livestock. Wait  wasn't overgrazing the problem? The key is how grazing animals are managed. 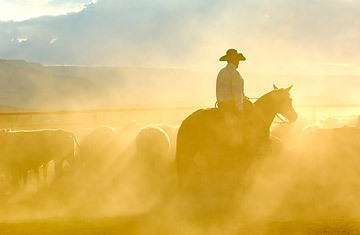 For according to Shannon Horst, CEO and co-founder of the Savory Institute, an organization dedicated to restoring the world's grasslands through Holistic Management, ranchers can consistently double, and even  depending on the condition of the land and adherence to the practices  quadruple livestock capacity over time. However, more cattle per acre is just one benefit. By actively planning and managing the grazing and recovery of the plants as opposed to allowing continuous grazing, ruminants become part of the solution rather than a burden to the land. Allan Savory, who developed Holistic Management as a researcher and farmer in Southern Africa, saw the connection between roaming animal herds and grassland vitality. The dynamic is as follows: the animal chews the grass so as to stimulate plant and root growth, and allow sunlight to get through to the growth points, then moves on in a herd either (in a leisurely way) to find fresher grass or (with a pounding of hooves) to elude a predator. He found that when domestic livestock are managed to replicate this behavior on degraded lands, the grasses come back: the deep-rooted plants enrich and aerate the soil and the hoof movements chip away at hardened earth so that seeds can germinate and grow and water can penetrate. Rich, aerated soil is productive, retains water, and, highly significant in environmental terms, is a carbon sink. "Healthy grasslands represents the ecosystem with the highest potential for carbon sequestration of any on the planet," says Steven Apfelbaum, Founder/Chairman of Applied Ecological Services, Inc., a landscape restoration company based in Brodhead, Wisconsin. He notes that grasslands cover more than 45% of the U.S., a proportion fairly consistent throughout the world. This has important implications for reducing atmospheric CO2. Plus, soil carbon plays a vital role in sustaining water supplies, which are perilously threatened in much of the West. "Every one percent increase in soil carbon holds an additional 60,000 gallons of water per acre," says Apfelbaum. "Water infiltrates the ground and replenishes groundwater sources. Springs reappear." The grassland landscape "co-evolved with grazing animals and plants and predators," says Shannon Horst. This was once a biologically synergistic community, she says, but over thousands of years human interventions like hunting, farming and domesticating livestock changed the nature of the symbiotic relationship and produced stress on the land. Specialists in land restoration say that by considering animals, plants, soil and water as a system farmers and ranchers can work to restore the carbon, water and plant nutrient cycles that underlie land's biological productivity, and ultimately economic viability. From this standpoint, excess atmospheric CO2 can be understood as a carbon cycle dysfunction: too much carbon is up in the air rather than in the soil, where it lends fertility (33% of soil organic matter is carbon). Similarly, floods and droughts are symptoms of a carbon cycle gone wrong: when soil is compacted or eroded, rain evaporates or runs off. This June, Allan Savory won the Buckminster Fuller Challenge for "Operation Hope," a program in Zimbabwe that uses livestock and Holistic Management to fight poverty and food scarcity through restoring soil, water and biodiversity to degraded lands.